Britain's Andy Murray reached the third round at Wimbledon with an impressive win over Dutchman Robin Haase. The Scot won 6-1 6-1 6-4 on court one in much cooler conditions than Wednesday's record-breaking temperatures. "I am very happy with the way I played," Murray told the BBC. 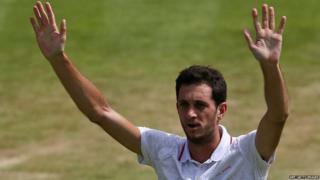 Another Briton, James Ward, is also into the third round at Wimbledon for the first time after beating Jiri Vesely. The 28-year-old saw off his big-serving Czech opponent 6-2 7-6 (7-4) 3-6 6-3 in two hours and 35 minutes. Andy Murray: Has he played his last match?